We don't turn the skis... rather, we make the skis turn, by tipping them on edge while staying in balance. Tipping the skis on edge must start with the ankle, which everts/inverts inside the boot. The boot must allow this movement, otherwise you will have a lot of trouble tipping the skis properly. Tipping and edging the skis is a continuous movement that disrupts balance throughout the turn - so we stay in dynamic balance via counterbalancing and counteracting these tendencies. Staying in balance on the outside ski while it is being tipped on edge is critical, so tipping and balance on edge always go together. One more thing. Tipping the outside ski is automatic - we need to focus on the inside ski more, to keep the shins parallel. 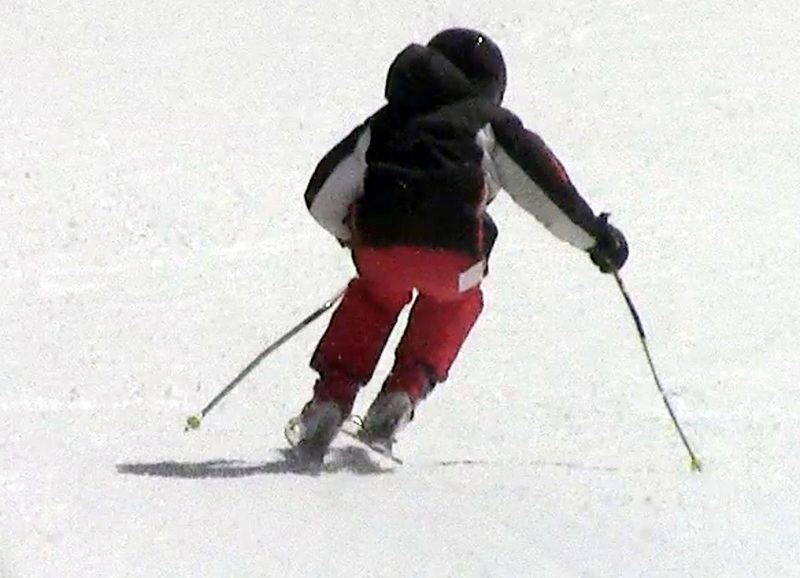 Also, the inside ski is the stance master since the other one is generally locked in a carve or otherwise weighted - a recurring theme of modern performance skiing. Stance, tipping and balance go together, see Stance and balance. Here's a sequence of drills to promote new movement patterns related to tipping, edging and balance. focus on balancing between the skis as they tip to 45 deg. repeat 3-4 times per traverse, then turn around and do it the other way - while turning around, don't just cruise but try your biggest tipping and biggest angles yet! Viewed 3099 times ( | Print ) this page.